This section of the paper focuses on the continuing help the martyrs give to the church. The topic of relics and loci are discussed. The Early Church believed the martyrs and other saints were able to intercede on their behalf and the relics of the saints were responsible for miracles. When the faithful look at the relics, it is as though with the eyes, the mouth, the ears, indeed all the senses they embrace the living body itself still blooming with life. With tears of reverence and tender feeling they address prayers of intercession to the martyr as though he were actually present there before them. The relics were traveling loci; in other words, they were traveling places where heaven and earth joined together. The relics and shrines of the martyrs also held a spiritual power which bore fruit in the earthly Church they left behind. Most of the posthumous miracles attributed to the saints were healings after contact with their relics or visiting their shrine. St. Augustine, in his sermon on the feast day of St. Stephen, told of some of the miracles wrought by the prayers of St. Stephen. He even goes on to show how he made this shrine public: “The reason I wanted to have them written there, after all, was so that any who wanted could read them, read them whenever they wanted…that’s why they are written up in public.” St. Augustine wants his church to have access to the saints at any time, because their prayers are powerful. In a sermon preached after the reading of a leaflet about the miracles attributed to the intercession of St. Stephen, St. Augustine begins to tell the story of a miracle performed at Uzalis, when he is interrupted by shouts of praise because a woman had just been healed at the shrine of St. Stephen. “And while Augustine was saying this the people around the shrine of Saint Stephen began to shout, ‘God be thanked! Christ be praised!’… the young woman who had just been cured was led into the apse.” St. Augustine describes the miracles attributed to the intercession of St. Stephen in several of his sermons. In Sermon 320 he tells the church to witness a man who was cured by the prayers of St. Stephen; St. Augustine presents him to the church saying that his presence is better than a leaflet describing the healing. From these testimonies and accounts it is clear that the martyrs bear fruit even after their death. They have been given the power to heal the sick and pray for those Christians left on earth. 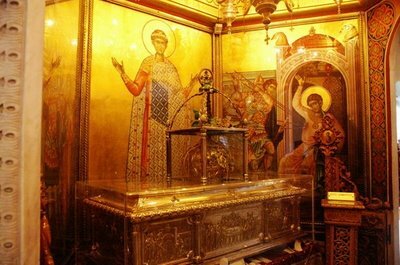 These relics of the saints and their spiritual power show the fruit of the martyrs, even after their death. Peter Brown, The Cult of the Saints: Its Rise and Function in Latin Christianity, (Chicago: The University of Chicago Press, 1981), 4. Even though St. Martin of Tours was not a martyr, his posthumous assistance shows the Church at the time believed the holy dead were able to help the living. Robert Markus, The End of Ancient Christianity, (New York, Cambridge University Press, 1990), 148-149. St. Augustine, Sermons: III/9 (306-340A) on the Saints, The Works of Saint Augustine: A Translation for the 21st Century, trans. Edmund Hill, O.P. ed. John E. Rotelle, O.S.A. (Hyde Park: New City Press, 1994), 153. Robert Louis Wilken, The Spirit of Early Christian Thought: Seeking the Face of God (New Haven: Yale University Press, 2003), 238. Augustine, Sermons III/9, “Sermon 319,” 153. Ibid. 154. St Augustine is speaking about the inscription he had written on the shrine. He does not tell the church what he wrote, but tells them to go read it because it is public. Augustine, Sermons III/9, “Sermon 323,” 163. Augustine, Sermons III/9, “Sermon 320,” 157. This entry was posted in Martyrdom and tagged church, loci, Martyrdom, NAPS, relic, saints. Bookmark the permalink.